5.0 out of 5 starsThe Heart is the Music of Life!! 5.0 out of 5 starsmay be an imperfect heart but it is a perfect romance! Anthony (Doc) and Kelly had one night together 10 years ago. Never in a million years did Kelly think she would ever see or need him again. But he has become a doctor, a pediatric cardiac surgeon, and that is what her unborn baby is going to need to save her life. I loved this story and how Anthony and Kelly are brought back together and how that night 10 years ago had meant so much to each of them. But it had ended bad and now Anthony knew he needed to do more than fix a babies heart to make Kelly see how much he loves her. I liked the fact that the hero is a good guy to begin with and even though Kelly is very stubborn he is even more stubborn and convinces her to let him help. Kelly has been a free spirit for ten years playing drums in a band and traveling. This is a new life style for her and she worries about her unborn baby. But through Doc her life is changing and all for the better. I felt the author gave us 2 very strong characters that are easy to like and care for and love Lucy, Doc's mom. She added a lot to the story. I could not put the book down as I needed to know what happened as I ended each chapter. I thought this was the first time I had read this author but soon discovered I had read "A Steel Heart" and loved it. Recommend this book...you will love it! This book is absolutely fantastic! Anthony and Kelly spent one incredible night together ten years ago and parted ways after Anthony receives a phone call. Who was it and what did they say to make him turn away? Fast forward ten years and Kelly has tracked him down asking for help. Her unborn baby girl needs his expertise as a pediatric heart surgeon. Will Anthony help or will he send her to another surgeon? WOW, this story was heart wrenching at times and then it would have me laughing out loud. I absolutely love the sass of Kelly and the sexiness of Doc! I highly recommend this book to everyone, but fair warning to have tissues at hand. No spoilers, but my questions were answered and I was smiling at the end. Never lose Hope and Faith! 5.0 out of 5 stars5 STARS! Poignant, moving and passionate second-chance romance! Amie Knight has simply blown me away with every single one of her books. Her writing style is sharp, witty, vividly detailed and rich in emotion. She creates characters that are endearing and relatable, and her heart-tugging stories are poignant, moving and passionate. They’re exactly the kind that I just sink into and get lost in. An Imperfect Heart is a beautiful second chance romance. Anthony and Kelly met in a flurry of attraction, connection and passion – at what was, unfortunately, the wrong time in their lives. Through a series of dual point-of-view flashbacks, Knight gives readers their youthful magic, bit by bit, letting them see how they met, how they connected and how they parted. I felt every bit of their bond through those glimpses of their past, and the history of this couple’s relationship unfolds brilliantly through them. I don’t know how Knight makes it through the writing of her novels, each one is packed with such intense emotions, but she successfully lays it all out for her readers to experience in painstaking detail. Just when it threatens to be too much, she cracks the tension with a dose of well-timed humor. Despite everything weighing so heavily on Kelly, she managed to hang on to her sense of humor. As a mother, Kelly was a very relatable character, and I absolutely felt her desperation and fear, and when she swallowed her pride and approached Anthony all those years later, she definitely earned my respect and empathy. He didn’t make her work very hard, though. Now a successful pediatric heart surgeon, he was loyal, honest, caring and thoughtful, but this man struggled. He was not only dealing with the professional implications of a relationship with Kelly, but he was also dealing with his own demons as well as his growing feelings for her and her baby. I don’t want to give too much away in this review, but right from the start, Knight drew me into this touching, tender story with a dual pronged plot that managed to be both gut-wrenching and full of hope. A slow burn romance built upon a solid foundation of friendship, I rooted for Anthony and Kelly every step of the way as they sifted through the regrets of their past and faced the uncertainty of the future. An Imperfect Heart was a truly memorable love story, something Knight is now known for, and one that will stay with me for a long time to come. 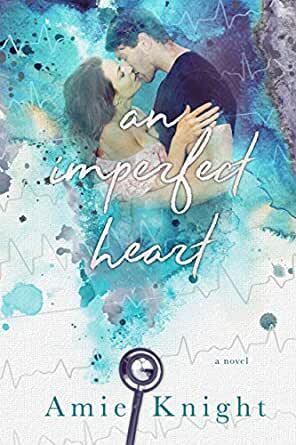 Five smooches from me for An Imperfect Heart by Amie Knight.